Standard action tags are better alternative for the scrptlet. The JSP/Servlet container is responsible for managing the life cycle of a JSP file. In general there are three important stages in JSP life cycle. When a JSP/Servlet container receives request for a JSP it checks if the JSP is initialized. 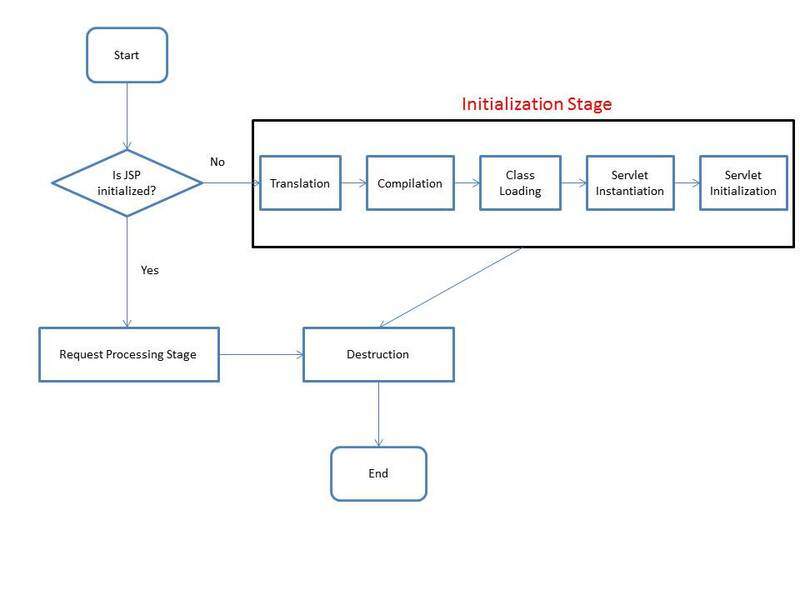 If the JSP is not initialized already then the container would take the JSP file through the following stages. 5 Initialization jspInit() method is called right after instance was created. jspInit() method is called only once during JSP life cycle. Initialization will make ServletContext and ServletConfig objects available for the Servlet. Every request from client is served by _jspService() method. The whole initialization stage is done to make the JSP ready to serve the client request. A Servlet/JSP container may call the _jspDestroy() method any time after the initialization. Once the _jspDestroy() method is called JSP file has go through to initialization process to be consumed by the client. Container may call the _jspDestroy() method as and when the container is gracefully shutdown or the container need to free up some memory to load other resources. Once the _jspDestroy() method is called the Servlet is no longer referred by a reference and the garbage collector can pick it up. How to run the sample program? When you need to pass some data from browser to the web server you may choose to use one of the HTTP request methods. The JSP implicit object ‘session’ is used to track user session between user requests. The JSP implicit response object contains the output to the client. The JSP implicit response object can be used for following. how to access jsp implicit object request in jsp page?